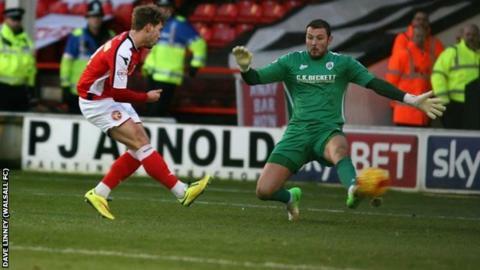 Walsall top scorer Tom Bradshaw insists that the praise needs to be shared by his team-mates for helping him reach double figures for the first time. Saturday's goal against Barnsley was the 22-year-old's 10th of the campaign. "The style we play suits my game," the Welsh striker told BBC WM. "The lads keep putting the chances on a plate. "It's a personal landmark to hit 10 goals for the first time. And to do it before Christmas, having missed seven or eight games, makes it even better." "After two play-off challenges petered out in the last couple of seasons, the original Ginger Mourinho - take note Burnley fans - feels he has assembled a squad that can go one better and finish in League One's top six. "The goals of Tom Bradshaw, and latterly Jordan Cook, will need to keep flowing and, with goalkeeper Richard O'Donnell and his back four in imperious form, then the omens look very promising. "If they can make it to Wembley for the first time ever too, the 2014-15 campaign would surely go down as the most memorable in their history." Bradshaw's persistent hamstring niggle, which sidelined him for most of October, has been the only setback he has suffered since making a summer move from relegated Shrewsbury Town. Having scored twice on his Shrewsbury debut as a late substitute at Crewe in April 2010, Bradshaw rarely got an extended run in the Town team over the next four years. But he has enjoyed a new lease of life since Saddlers boss Dean Smith offered him a fresh start at Bescot. "Football's a crazy game and it's just one of those things," he said. "But really it's a combination of the way the manager wants to play and the confidence he's shown in me as a footballer. "And the whole team are now playing with a lot of heart and getting points on the board. "When we went 1-0 down on Saturday it was just a question of turning it round. But Jordan Cook took his two goals brilliantly and, as soon as we had turned it round, I knew we'd go on and win." Dean Smith's Saddlers boast the best defensive record in League One this term, having leaked just 17 goals, only six of which have come at Bescot. Walsall keeper Richard O'Donnell has kept nine clean sheets in 20 League One matches. After an indifferent start to the season, Walsall have now lost just once in 10 matches - the FA Cup first-round replay defeat at Bradshaw's former club Shrewsbury. They have won four of their last six matches in an unbeaten run that has taken them to 12th in League One, just four points off the play-offs - and they are also as close as they have ever been to Wembley, having reached the northern area final of the Johnstone's Paint Trophy. The Saddlers will face Preston North End in the two-leg regional final but Bradshaw says he is focussed only on their next batch of six league games, over and beyond the festive period. "Wembley talk is at the back of our minds for now," he said. "That's not until mid-January."